This first floor one bedroom apartment is a quiet retreat for busy tourists, with a capacity to host up to four guests. The Segol suite is a one bedroom apartment with sleeping capacity of up to four guests. The apartment will be cleaned before your arrival, spare linens and towels are provided. After your departure, the apartment will be cleaned at no extra charge. During your stay, maid service is available. If you would like the maid to clean the apartment, change the bed linens and provide fresh towels, this service can be provided at a fee. The Segol faces the rear garden of the building, offering guests a quiet retreat from the bustle of the city. The open living and dining area is carefully yet simply designed to facilitate an easy stay. Should one choose to dine in, the supermarket is on the next corner. The compact kitchen is equipped with sufficient utensils to prepare light meals. The kitchen table has four chairs with extra chairs available. In addition to the microwave, there are two easy to use electric stove tops a small oven and compact fridge. Please note that the kitchen pots are kosher dairy. The bedroom is fitted with a queen size bed, a closet and TV. Please note in the bedroom there is a ceiling fan. Amenities included in the apartment are: air conditioner unit in the lounge, WIFI, Cable TV, washing machine, safe, iron and hairdryer. Onsite parking for a small car is available for this apartment upon advance request and subject to availability. Our family of four was comfortably housed in the apartment for most of the Passover holiday. The apartment was koshered as per our request. There were plenty of Kosher for Passover eating options and synagogues in the neighborhood. We love to walk and spent a lot of time strolling along the nearby historical railroad tracks and all through the various neighborhoods of Jerusalem. Aviva was very helpful. We had a wonderful stay and would definitely return. Thanks for your hospitality. I was fortunate to experience 3 of the Colony Suites during my 4 weeks in Jerusalem.The Levant, The Segol & The Studio.I found them all of a high standard for international travelers. The Manager, on a day to day basis was exemplary with her communications and help and nothing was a problem whatever you needed to ask or have done.What a pleasure! All the apartments are very comfortable and situated right in the heart of the German Colony close to shops and buses. A great place to stay. Thank you Colony for a lovely stay. I rented the apartment for my parents during their visit from the UK. The location was very convenient, the apartment was very well-maintained and compact. The arrangements for arrival and departure and other management support were convenient and very friendly. My parents had rather a nice long chat with Linda one night when she came to check that all was well with them. 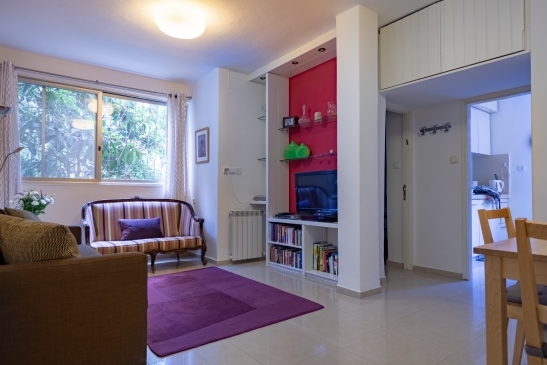 I recommend the apartment also in terms of price, relative to other accommodation in this area of Jerusalem. We stayed in the one bedroom for five days. It was just as advertised. We were met upon arrival and had everything we needed. We could walk to everything; the location is perfect! We stayed right after Passover and it was just delightful. The unit was clean, spacious and well stocked. The staff was so friendly and helpful it made our stay so much easier. We will be staying there again!! We found this to be a great location for us because it wasn't far from my son's yeshiva. Emek Refaim street is great with nice shops and restaurants. You can take buses or taxis all around Jerusalem from here. The apartment is somewhat spartan but big by Israeli standards. There is also a small kitchen. We were happy with our stay here and would stay here again. Can't beat the location! The apartment was clean and just right for our needs. Was just as advertised. We were met upon arrival and everyone was helpful.